Shhhhhhhhhhhhhhhh. I'm about to trespass. Excuse me as I creep into the rose (perfume) garden where NST's Jessica resides. Though I know she'll greet me kindly if she spies me...I feel guilty! (I've certainly not sampled the same number of rose perfumes she has!) Today, I'm reviewing my first perfumes from Terry de Gunzburg: Rose Infernale and Rouge Nocturne; both rose-centered perfumes were developed by perfumer Michel Almairac and they were released last year. Rose Infernale begins with peppery, almost leather-scented, rose blossoms (we're talking dark red roses here, nothing pure white or baby pink). Though the roses leave a trail from Rose Infernale's beginning to its fade-out, you never get a rose solo; the blossoms are always accompanied — by spices to start, liquor-y incense in the middle and smooth vetiver near the end. Rose disappears in Rose Infernale's curtain call: all that's left is dry-musky-smoky incense. Rose Infernale goes through its phases quickly and, on me, wears more like an Eau de Toilette than an Eau de Parfum Intense as Gunzburg advertises. Rose Infernale's sillage is discreet; it lasts a short time on skin but will last for hours if you get some on your clothing. Rose Infernale reminds me of Eau d'Italie Paestum Rose, but with much less presence. I often wish candle aromas were available in perfume form; in the case of Rose Infernale, I'd prefer its scent in a candle or soap; then I wouldn't fret about its lack of heft or its fleeting nature. bergamot, damask rose and "amber patchouli"
Rouge Nocturne opens with a short-lived figgy-coconut aroma; next, I smell white flowers and a hint of musk mixing with gorgeous bergamot. One friend asked me, just minutes after I spritzed myself with Rouge Nocturne, if I was wearing Guerlain Habit Rouge. I said, "No!" Later, I sprayed one arm with Rouge Nocturne and one arm with Habit Rouge; they were similar for a short while, but Rouge Nocturne is a much quieter scent. Several minutes after the Habit Rouge phase, Rouge Nocturne reminded me of another perfume: The Crown Perfumery Eau de Russe (with its vanillic-amber-tinged bergamot). Let's say Rouge Nocturne opens with positive perfume associations for me. In its heart notes, Rouge Nocturne presents its Damascus rose: cosmetic in character (yes, another "lipstick rose"). Rouge Nocturne lasts much longer on me than Rose Infernale; its base is an amber-y "sepia" rose: woody-vanillic with burnished patchouli. I would characterize Rose Infernale as unisex and Rouge Nocturne as unisex/feminine-leaning; both perfumes smell expen$ive. Do I desire either? Nope. I much prefer Habit Rouge, Eau de Russe and Paestum Rose — all those have more oomph and personality. As for Jessica: I've promised her some homemade rose-petal jam as thanks for my absconding with a "few roses" today. 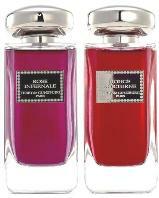 Terry de Gunzburg Rose Infernale and Rouge Nocturne are available in 100 ml Eau de Parfum Intense, $210. Note: top images by author. Lucky for Jessica, I bet you make magnificent rose jam, Kevin! Chandler b, Habit Rouge is great…my bottle is almost drained, too. Rose Infernale sounds just gorgeous!! How would it compare with Amouage Lyric for Women or even Caron Parfum Sacre? 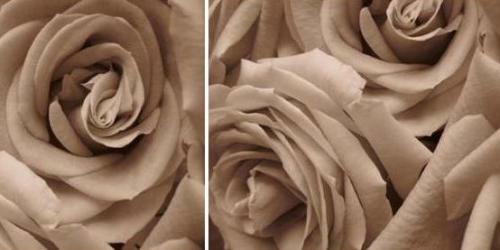 Rose Infernale is smokier incense, and more rosy, at least at first, without Parfum Sacree’s animal notes, to my nose. Parfum Sacree is more blended, and subtle. Nothing subtle about Rose Infernale to me, but that’s not a bad thing, I like it more and more as I wear it out and about. I think I will wear it a lot as we move into fall. Parfume Sacree is more what I reach for in the deep of winter. Thank you for your extra comments! AnnS: adding — I think it’s “very nice”…for me it’s “timid”…but you’ll see others disagree; all a matter of your taste of course. One man’s timid, is another man’s tiger! It sounds sniff-worthy either way! Perhaps I’m still a little bitter about being swaplifted with the promise of several Terry de Gunzburg travel sprays. I never really warmed up to this brand. I will stop by Barneys and have a sniff of the Rouge Nocturne. hajusuuri: Thanks! After trying these two, I’m not going to go to much trouble to find others in the line…if they fall into my lap, fine! HA! Good! Every time I came across a picture of those brightly colored perfumes I was fretting a bit over whether I needed to seek out samples. Now I’m happy to rely on good ol’ Habit Rouge and Paestum Rose. Hahah! I welcome one and all to the rose garden. Plenty of room.